Traveling presenters. Traveling sales people and tutors will love the compact size and the high-quality images from a variety of sources--cell phones, USB memory keys, PCs, and its own internal memory. If you're on the road it's great for watching a movie in your hotel room afterward. Casual Home Entertainment. Good video quality, a bright picture for its size, and 16.5 ms lag time make it an excellent choice movies, video gaming, or even a backyard movie night. Short throw -- a 50-inch diagonal image at 34 inches from the screen. Good audio with suitable volume for a small room. Auto and manual keystone correction. Physical attributes. All of the ports are on the back panel. Viewed from behind the projector, the Kensington lock slot is on the left, the DC power input is about half of the way between the midline and the right side, and the fan-driven hot air exhaust vents are on the right side, both above and to the right of the power connector. The primary cooling intake vents are on the right side of the front panel. Additional convection vents--not fan-driven--are on the left and right side panels. Low Lamp Mode. There is no low lamp mode in the usual sense of a lamp setting that you can use with any color preset. Instead, the Eco mode is a preset of its own with far lower brightness than any of the other choices. It could be useful if you need to give a desk-side presentation in dim light with a small image size. Perceived Brightness. We judged the image as comfortable for extended viewing at a larger size than the measured lumens would predict. The measured brightness in Cinema mode, for example, suggests that a 78" image would be ideal for theater-dark lighting. We found that an 80" image held up nicely even with dim ambient light and was usable, although a little washed out, in moderate ambient light. Presentation Optimized Lumens. The menus offer few options to tweak image quality, and the default settings in most modes offer high enough color quality so you don't need to. For most purposes, PC mode will give you the best balance between color quality and brightness for presentations, with about 410 lumens. Video Optimized Lumens. Cinema and Photo mode offer nearly identical color quality and brightness, but Cinema mode gets the nod for best video quality overall, with a brightness of about 320 lumens. Optoma says it's calibrated to Rec. 709, the ITU standard for HDTVs. Zoom Lens Effect. The short throw lens doesn't offer zoom, so no light is curtailed due to zoom lens effects. Brightness Uniformity. The measured 80% uniformity is high enough to make brightness differences impossible to see with any image that breaks up the field of view. Input Lag. The Bodnar meter measures the input lag at an extraordinarily fast 16.5 ms in all preset modes. On-board Audio. The audio system is far more usable than typical for this size projector. The sound quality is more than acceptable, and the 1.5-watt speaker puts out easily enough volume for a small conference room or family room. Fan noise. Fan noise varies depending on the pre-set you're using. It is easy to hear from five feet away in Bright mode as a constant low-level buzz. In PC mode the sound level drops noticeably and the quality change to more of a hum. In Cinema and Photo modes, it's quieter still. If you're particularly bothered by noise, you'll probably want to avoid Bright mode and might not want to sit right next to the projector in PC mode. There is no High Altitude mode. The published rating of 22 dB is in Eco mode only, and in this mode it is nearly impossible to hear. Throw distance. With no zoom lens, the throw distance determines image size. For the native 16:10 aspect ratio, the throw distance for a 100" diagonal screen is roughly 5.5 feet. There is a digital zoom, but only two settings that shrink the image, showing it at 75% or 50%. See the Projection Calculator to find the right throw distance for the image size you want. Vertical Offset. For a 16:10 image, with the projector on a table in front of the screen, the centerline of the lens intersects the bottom edge of the image. The offset will work nicely with the projector on a table facing a wall-mounted or pull-up screen. It's ideal for a small portable screen sitting on the same table. If you have to tilt the projector, you can adjust for keystone distortion of up to plus or minus 40 degrees using auto or manual settings. There is no horizontal keystone adjustment. 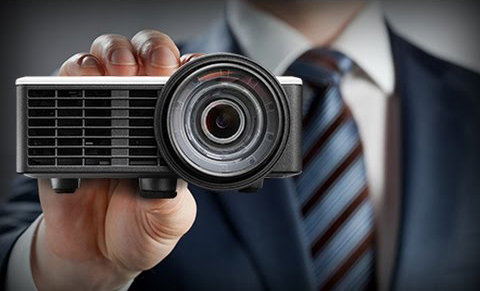 At just 1 pound 11 ounces complete with the power block, the $549 Optoma ML750ST is a stellar choice if you need a 1280x800 projector that's small enough to fit in a briefcase or store unobtrusively on a shelf in its book-size carrying case. For traveling presenters doing sales presentations or educational tutoring to individuals or small groups, the ML750ST's ability to connect to a cell phone or read files from memory card or USB key means you don't have to bring anything heavier along with it. 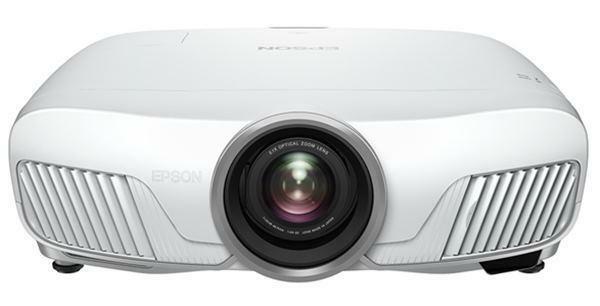 It's a particularly good choice for presentations that include video clips, and in its presentation-optimized setting, it's bright enough for at least a 52" image in moderate ambient light, even based on recommendations for lamp-based projectors. The high-quality video and excellent color quality in Cinema mode also makes the ML750ST a top choice for home use. If you want a unit you can move easily to any room to set up as needed and still have an impressively high quality, 80" image even with some lights on, it's a perfect fit. And with it's 16.5 ms lag time, gamers will have only themselves to blame for slow reaction time. The ML750ST uses a 0.45" DMD from TI with a native resolution of 912x1140 arranged in a diamond pattern array. The visual quality for the image is noticeable less that 1280x800. Its particular bad at displaying black text on a white background.